We offer an exclusive and professional service at major centres in South Africa to both the Business and Leisure traveller. The Chauffeur Driver will be at your appointed rendezvous at least 10 minutes ahead of time to assist you with your luggage. We offer individual, personalised chauffeur service. •	Hertz Chauffeur Drive has a large support infrastructure with the experience and ability to meet your every changing need. The rate includes the Professional Chauffeur Driver, meet and greet service, passenger insurance cover (excluding personal property) and fuel. Payment for both options is by credit card or corporate account. 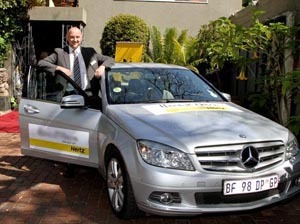 on 08000 43789 (+27219354852 for international) or res@hertz.co.za. Alternatively, you can click the button below to fill out an online request. Transfer service is available for groups E, H and N.
You will be collected and taken to your destination by a licensed PDP driver, full insurance cover (excluding personal property) and fuel. The rate has been determined according to kilometre distance from point of pick-up to drop off, and calculated in zones. Bookings are to be made in advance and can be done by contacting our reservations centre on 08000 43789 (+27219354852 for international) or res@hertz.co.za. Alternatively, you can click the button below to fill out an online request.